Remember the first time you died while playing Mortal Kombat? One minute you were preparing to throw an uppercut and the next Kano had your character's still-beating heart in his hands. Well, the mega-franchise has evolved a lot since its arcade days, but it's still as drop-dead gruesome as ever—especially with the exclusive release of Mortal Kombat for PlayStation Vita. So to celebrate the most recent incarnation, which features 150 new on-the-go missions, Kotaku is taking a look back at the original game that ripped out your spine, punched off your head, and demanded that you, "Finish him!" Mortal Kombat wasn't the first arcade fighting game, but in 1992, its unique gameplay system and awesomely gory finishing moves quickly caught the attention of joystick fiends all over the world. The original game featured seven main characters: Sub-Zero, Kano, Raiden, Liu Kang, Scorpion, Sonya Blade, and, of course, the groin-punching Hollywood hero, Johnny Cage. Each character had their own signature set of moves—several only possible with some deft joystick-handling. As developer Ed Boon said back in 2007, "One of the things that's separated [Mortal Kombat] from other fighting games is the crazy moves we've put in it, like fireballs and all the magic moves." But what Mortal Kombat quickly became known for was the gruesome Fatalities. They were the ultimate way to humiliate one's opponent. Sure, the delicate sensibilities of moms and ESRB sensors might have been offended when Scorpion burned the skin off the face of his foes (toasty! ), but players loved it. All that gore couldn't be contained in the arcade, so on September 13, 1993 (on what became known as "Mortal Monday") bloodthirsty gamers across the country celebrated the game's home console release. Living rooms from Cape Cod to Cape Flattery echoed with yells of, "MORTAAAAL KOMBAAAAT!" Over the past 20 years, 17 titles have been released as part of the Mortal Kombat series, and on May 1, one more will be added to the fray. In an exclusive partnership with PlayStation Vita, Mortal Kombat will feature an all-new Challenge Tower mode, Touchscreen Fatalities, Xrays, and never-before-seen environments—all on an incredibly impressive 5-inch OLED screen. 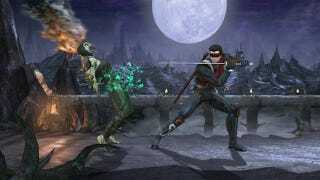 Head here to experience the spine-wrenching effects of Mortal Kombat for PlayStation Vita for yourself.